Refractive lensectomy is the same procedure as modern “no-stitch”, “no-needle” cataract surgery. 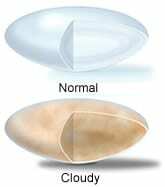 It changes the eyes optics by replacing the natural lens with a lens implant that is specifically chosen based upon measurements taken during your preoperative assessment. The lens implant remains in place for your lifetime. In the past, the lens was usually selected to focus clearly for distant objects; thus glasses were needed for near vision activities like reading. Now, we can offer multifocal lens options that provide focus at distance and for reading simultaneously. Astigmatism can also be corrected during this procedure using a technique called “limbal relaxing incisions.” This is a reshaping of the cornea, performed during the lensectomy, to minimize astigmatism and reduce dependence on glasses. Lensectomy may be an attractive option for people over 45 years of age. For individuals over 45, the natural ability to focus up close is progressively lost. Individuals over 55 usually do not have much natural focusing ability for near vision. Thus, refractive lensectomy may be a wise choice for individuals in this age category. Refractive lensectomy is a simple outpatient procedure. In most cases, only eye drops are needed to numb the eye for the surgery. People are not “put to sleep.” but are given oral or intravenous medication for comfort. A small incision is made in the cornea (approximately 3 mm). Using a special ultrasound probe, the lens is gently removed in small particles. After the natural lens is removed, a lens implant of appropriate power is placed through the incision and into the proper location. The surgery is usually completed without stitches and takes about 15 minutes.